We've extended our service area that includes: PA, NJ, DE, MD, DC and VA! Click on each logo to learn more about their services and our blog above to read about the acquisition. When you run a commercial kitchen, you have a special obligation to provide a safe environment for staff and guests alike. Working with high heat, oil and other flammable materials requires specific safety precautions to protect not only the people under your roof, but also your investment in your business. Stay compliant with safety regulations and keep your customers, staff and investment safe with Universal Fire Protection equipment in your kitchen. Specializing in restaurant fire protection, we offer a number of solutions for preventing and suppressing kitchen fires. We can provide you with individual equipment like portable fire extinguishers or design and install complete fire protection systems in your restaurant. Our Family Business Since 1963! 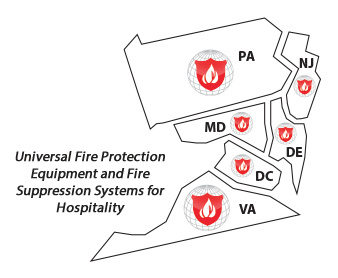 Universal Fire Protection is part of a proud family of companies serving the needs of hospitality industry clients in Pennsylvania and New Jersey. For over 50 years, we’ve been building our expertise in kitchen fire suppression, allowing us to design effective restaurant fire suppression systems for kitchens of all shapes and sizes.